Pub near Surrey Quays Station, opposite [Southwark Park]?. It's quite plain inside, and the bar and pool table take up much of what space there is. There are several dart boards, although at least one is situated directly above one of the tables, so you'd not be able to play if there were people sitting there. There's a beer garden out the back, with picnic benches and white plastic chairs; some of it is under a canopy. On Kake and bob's April 2009 visit, the two handpumps offered London Pride (£4.35 for a pint and a half, which works out at £2.90/pint) and Tetleys. The Pride was fine, though served through a sparkler. Kake's half came in a cute little stemmed glass. 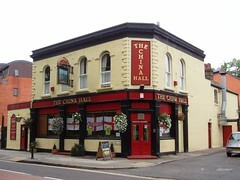 On another visit in April 2011, the Tetleys was still on and the other handpump had Spitfire (£3.20/pint). On our April 2009 visit (a Tuesday evening), a football match was showing on the flatscreens, and everyone except us was watching it with great excitement. There was no background music to compete with this. One suspects they show quite a lot of sport; there was a sign on the door pointing out that if you want to watch live sport you must spend at least £5 at the bar. Accessibility: A step up to get in at both entrances, but there's also a RADAR-locked accessible toilet. One of the cubicles in the ladies' is extra-large with a door opening out. Small step to beer garden. Last edited 2015-01-29 11:44:12 (version 4; diff). List all versions. Page last edited 2015-01-29 11:44:12 (version 4).